Dubstep is a genre of electronic dance music that originated in South London in the late 1990s. It is generally characterized by sparse, syncopated rhythmic patterns with prominent (and often wobbly) sub-bass frequencies and epic breakdowns. 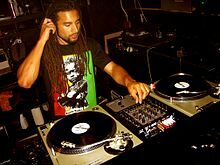 The style emerged as an offshoot of UK garage, drawing on a lineage of related styles such as 2-step and dub reggae, as well as jungle, broken beat, and grime. In the United Kingdom, the origins of the genre can be traced back to the growth of the Jamaican sound system party scene in the early 1980s. 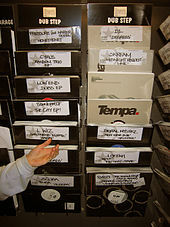 The earliest dubstep releases date back to 1998; they were usually featured as B-sides of 2-step garage single releases. Early tracks were darker, more experimental remixes with less emphasis on vocals, instead attempting to incorporate elements of breakbeat and drum and bass into 2-step. In 2001, this and other strains of garage music began to be showcased and promoted at London's night club Plastic People, at the "Forward" night (sometimes stylised as FWD>>), which went on to be considerably influential to the development of dubstep. 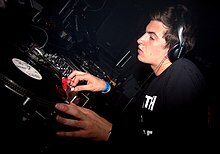 The term "dubstep" in reference to a genre of music began to be used by around 2002 by labels such as Big Apple, Ammunition, and Tempa, by which time stylistic trends used in creating these remixes started to become more noticeable and distinct from 2-step and grime. ^ "'The potential for disaster was just too big': small Canadian city shuts down Skrillex gig – FACT Magazine: Music News, New Music". Retrieved 16 November 2012. ^ "Dubstep Maker: The Software & Video Tutorial You Need". Ledger Note. Retrieved 14 October 2015. ^ Sherborne, Philip (5 April 2016). "Popping the Drop: A Timeline of How EDM's Bubble Burst". Pitchfork.com. Conde Nast. Archived from the original on 4 January 2018. Retrieved 23 January 2018. ^ Chris, Riemenschneider (13 August 2015). "Metalhead turned dance-music star Bassnectar is happy to headline this weekend's Summer Set fest because its lineup is more eclectic than "electronic."". Startribune.com. The Minneapolis Star-Tribune. Archived from the original on 24 January 2018. Retrieved 23 January 2018. Dubstep obviously is already a thing of the past. ^ Champagne, Jesse (14 March 2014). "Dubstep May Be Dying, Just Don't Tell Canadians That". Vice.com. VICE Magazine. Archived from the original on 23 January 2018. Retrieved 23 January 2018. Dubstep is DEAD… The movement is over. ^ Aroesti, Rachel (7 September 2017). "Mount Kimbie: Love What Survives review – electric wit and wisdom from London synth duo". The Guardian. Archived from the original on 11 November 2017. Retrieved 23 January 2018. ^ Lozano, Kevin (10 May 2016). "James Blake: The Colour in Anything". Pitchfork Media. Archived from the original on 17 August 2018. Retrieved 25 August 2018.